Greece Soccer Team - EURO 2004 Champions - Antonios Nikopolidis - by La Cancha-News On World Cup 2006 - "World's Leading Soccer Magazine!" Since joining Panathinaikos FC as a teenager in the 1980s, Antonios Nikopolidis has matured into an excellent, physically imposing goalkeeper. Two years after making his debut in a friendly international victory against El Salvador on 18 August 1999, Nikopolidis had become the undisputed choice in Greece's goal. 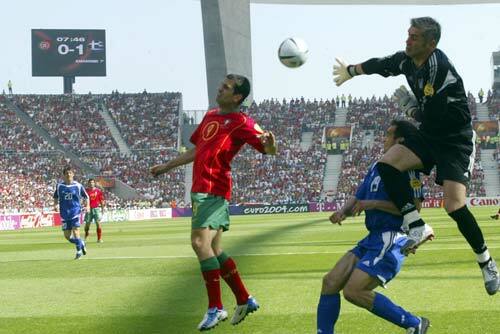 He played in qualifying for the 2002 FIFA World Cup and excelled as Greece qualified for UEFA EURO 2004, keeping six clean sheets and not letting in a goal in the three knockout games as he claimed a winner's medal and a place in the All-Star Squad. Born in 1971, it took six years for Nikopolidis to reach the first team at Panathanaikos after his move from third division side Anagennisi Arta as an 18-year old in 1989. 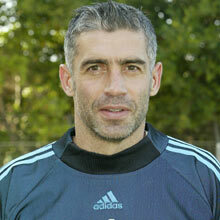 Since his debut in 1995, however, he has gained a reputation as one of the most reliable goalkeepers in Greek football. He played five games as the Greens won the championship in 1994/95 and three as they retained it the following year. Although Olympiacos CFP have since monopolised the Alpha Ethniki, Nikopolidis has performed with distinction, helping the club reach the 2001/02 UEFA Champions League quarter-finals. Nikopolidis then missed just two league matches to help Panathinaikos achieve the best defensive record in Greece, although Olympiacos again reigned supreme. 2003/04: Played 18 of the first 20 games only to lose his place to Konstantinos Chalkias when contract negotiations broke down in February. He ended the season with a championship medal, and a transfer to Olympiacos on a three-year contract.